It is clear Mr McAleer senior is well known in the town as, during the interview with Business News, he repeatedly had opportunity to tap on the window to acknowledge the folk passing by. 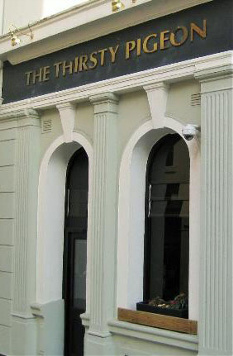 The freehouse is making a name for its selection of real ales, popular beers, fine wines and spirits such as whiskies . Mr McAleer, junior, said he was relishing the opportunity and challenge involved in running the pub and promised an emphasis on providing good ser vice was paramount. Customers are also enjoying the food provided at the traditional pub including a tempting choice of pies. 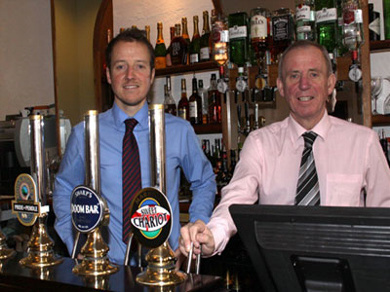 Mr McAleer, junior , said he was relishing the opportunity and challenge involved in running the pub and promised an emphasis on providing good service was paramount. Customers are also enjoying the food provided at the traditional pub including a tempting choice of pies. The Thirsty Pigeon is a one room pub with time honoured button back seating, in dark green with matching bar stools, compliment the dark wood interior. Very good use is made of the space to accommodate a number of customers without feeling crowded. The unfussy décor with clean lines combined with the traditional make the Thirsty Pigeon popular with frequenters of wine bars and traditional drinkers alike. As does the management style of a friendly welcome and good manners. Two recent attractive additions of Manx cider and window boxes. The first, and as yet only pub on the Island to accept Bitcoin! 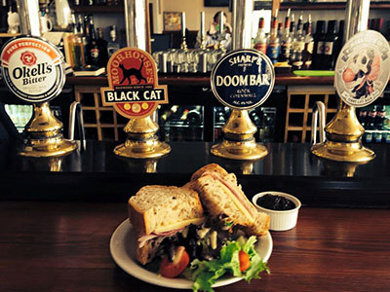 We serve a choice of regular beers and guest ales from local brewers. If you like a real pub The Pigeon is the place. Always busy beer is always spot on. They make there own specialist shots which are very powerful. Always a great night during TT time very busy and worth the visit just for the crack!